The practice of Matthew Langan-Peck (b. 1988), currently based in New York, traverses drawing, installation and painting. 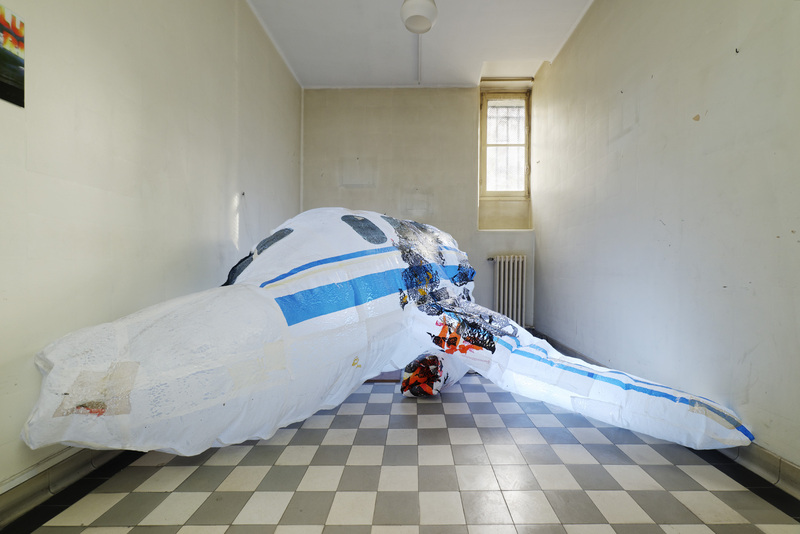 Through manipulating and experimenting with materials and space, the artist explores the economy of installation, ad-hoc materiality and space occupation. The artist makes peculiar, amusing and almost childish objects from simple shapes and materials. While the objects in his installations are too big to be games, often embarrassing by their volumes, and some may seem ridiculous; the objects contain an opposition — or a tension — that combines playfulness with the fragility of life. They are, at once, ambitious gestures of power and delicate assemblages of waste and recycled materials. If this practice is reminiscent of Claes Oldenburg, the works of Matthew Langan-Peck are imprinted with a resigned poetry. The modesty of the work and the fragility of the forms bear a tragi-comic resonance heightened by his evocation of a possible disappearance.